Car Accident in Freehold? Why Chiropractic Care is the Best Option! Car accidents happen every day and most people have been in one during their lifetime. As a chiropractor in Freehold, NJ, I see patients from the area, including Marlboro, Manalapan, Howell, Colts Neck, Millstone, Morganville and Jackson, New Jersey in Monmouth County. While reading some articles online today, I came upon Denver Chiropractor, Dr. Trent Artichoker’s blog post on auto accidents. It reminded me how important it is to educate the community the importance of getting their spines checked after an accident, no matter how serious one things their accident is or is not. Many times people walk away from an accident not feeling any pain, but even a 5 mile per hour little fender bender results in whiplash injuries, also called cervical acceleration deceleration syndrome. It’s important to get checked to prevent future problems, not only with the body, but trying to get coverage by the auto insurance. It’s possible that the symptoms from this type of injury don’t show for days, weeks, months or even years down the road. I have patients that come into my office with neck pain, headaches, lower back pain, sciatica, numbness and tingling down the arms, or mid back pain not knowing where it came from, but upon proper questioning usually find out the patient had a car accident years before that they thought was harmless. After an exam, it can usually be traced back to the car accident. The difficult part is, if the problem has been laying without symptoms for months or years, scar tissue builds up and is more difficult to correct. So, whether you do or do not have pain after an accident. It is so important to get examined by a qualified health professional. Many seek the help of a medical doctor, but in most cases they will just treat the symptoms with pain medication, ice and rest. This makes the problem more chronic in the long run as the underlying cause of the pain is not corrected. Dr. Artichoker mentions in his Denver Chiropractic blog there are many options in treatment of an auto accident, but I totally agree that chiropractors are are at the top of the list to get examined and treated by as we are one of the only health professionals trained to examine the joints, nerves, muscles, tendons, ligaments, discs and other soft tissues and the in treatment in these musculoskeletal conditions. Documentation of these findings and treatment are so important, especially for insurance needs and in case attorneys and a court case is in the future. Remember.. no accident is too small for problems to occur. Call our office if you have been in a motor vehicle accident to make sure no underlying problems are present and to get treatment quickly to expedite recovery. Every year millions of people are injured in car accidents. Even minor accidents as low as 3MPH can cause whiplash as well as chronic symptoms and disability. Many times people can present with pain not realizing it came from an accident 10 years ago or even much longer. So the question arises what is the best treatment for auto injuries? with medications or injections, chiropractic corrects the cause of the pain. Following are reasons why chiropractic is the best treatment for auto injuries. Chiropractic Reduces Pain: Studies have shown how effective and safe chiropractic is in reducing pain. You may experience neck pain, back pain or even more widespread pain after a car accident. It is important to be treated immediately after auto accident to prevent pain all over and long term chronic disability. A 2014 study reported that people who received a chiropractic adjustment had increased levels of pain-reducing hormones in their bloodstream. Chiropractic Relieves Whiplash And Headaches: Our Freehold chiropractor wrote an article about this topic which you can read further clicking: Whiplash and Auto Injury? Chiropractic Corrects Range of Motion: Joints become misaligned in an accident. This causes restricted motion. Areas of the spine can also splint due to pain and inflammation. Motion is an important part of healing including reduction of swelling. The longer joints remain restricted you also get a build up of scar tissue and degeneration of the discs and joints. 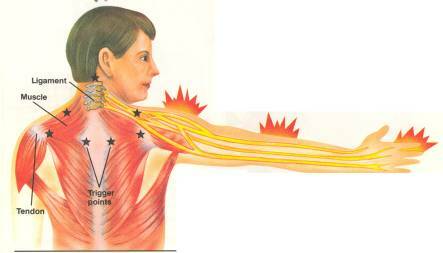 Chiropractic adjustments improve range of motion therefor increasing circulation. Chiropractic Reduces Swelling and Inflammation: Trauma to the musculoskeletal system during an accident causes stretching to the ligaments, tendons and muscles. Injuries can also occur to the discs. These impacts usually result in inflammation. After an accident many people get an X-ray which might show a broken bone but it will not show the inflammation. Many times people don’t feel immediate pain after an accident but there can be micro-traumas and inflammation. The next day or even weeks to months later you can start experiencing pain and stiffness. This occurs because the body is reacting to the inflammation from the previous accident. A study shows getting adjusted by a chiropractor helps reduce the swelling by releasing Interleukin 6 which is an anti-inflammatory of the body used to help heal acute injuries. The improved motion of the joints also acts like a pump to increase blood flow and removal of inflammation. Blood gets more oxygen and nutrients to the area to help the healing process. Chiropractic Breaks up Scar Tissue: Scar tissue is your body’s way to try and heal muscle, tendon and ligaments. Scar tissue is not as elastic or as strong as regular tissues. It’s important to help break up scar tissue to allow stronger tissue to be formed. Chiropractors adjust the joints that are restricted. This allows effective stretching and breaking up the scar tissue. In our Freehold chiropractic office we also use some soft tissue techniques to break up fibrotic tissues to allow for better healing. Chiropractic is STRESS Relieving: It is very stressful when somebody gets into an auto accident. The stress of injury, pain, dealing with the insurance and police, not able to work nor able to do normal daily activities. Anxiety, stress and depression are common. Studies show chiropractic for neck pain reduced brain activity that is responsible for pain and stress responses. Those adjusted also had significant reduction of cortisol levels. Patients in the study that got adjusted had lower pain scores and improved quality of life. A body that continues to be stressed recovers more slowly and results in chronic pain and degeneration. Chiropractic Helps Prevent Chronic Pain: It’s important to get treated as early as possible after a car accident. A couple studies around 2000 find those patients that receive mobilization treatment immediately after an accident recover more quickly and fewer residual problems. Getting joints moving optimally helps obtain this goal. Chiropractic WORKS! For many years studies have shown chiropractic is beneficial to help injuries from car accidents. A British study found 93% of patients showed dramatic improvement of their neck pain when receiving chiropractic. A Canadian study this year shows the most important factors in recovering quickly are spinal adjustments along with staying active. Are you suffering with dizziness and balance problems? suffering with dizziness and balance problems or vertigo. The Role of Chiropractic Care in the Treatment of Dizziness or Balance Disorders: Analysis of National Health Interview Survey Data is a new study this year of data from a 2008 survey. 11% of respondents experienced one or the other symptom of which 35% were age 65 or older. The researchers than analyzed further to find the successful role of chiropractic in treating dizziness and balance. Although only 4.7% of the patients sought chiropractic care, they had the highest success rate. These patients reported most that chiropractic helped. The lowest success of treatment was for the 84% of patients that went to their general practitioner. The highest success group receiving chiropractic care were those age 65 and older, those that experienced trauma or had neurological or musculoskeletal issues as the cause of the dizziness and balance symptoms. The study suggests that dizziness and balance problems are likely due to neck dysfunction. This condition is called cervicogenic dizziness. It is common after an car accidents, falls and even sports injuries. Chiropractic is about getting to the cause of the problem. Chiropractors adjust the area of the spine which helps remove pressure from the nerves. This restores normal function to the areas affected by the trauma and relieves conditions like dizziness and balance. An added benefit is chiropractic doesn’t involve the side effects of medications or risky surgeries.